Chennai (formerly known as Madras) is the largest cosmopolitan and capital city of Tamil Nadu. Chennai is located on the Coromandel Coast of the Bay of Bengal. This city was developed after 1639 when the East India Company established a fort and trading post at the small fishing village of Chennai. This city is about 350 years old and a gateway to the South, provide many visitors a fascinating and rich southern heritage. The city of Chennai has blended the foreign influence with the traditional Tamil-Hindu culture. Chennai has everything to offer to its visitors which ranges from the continental and typical South Indian cuisine, long stretches of beaches, modern shopping centres, temples, forts, palaces, traditional handicrafts and textiles. Chennai can be visited throughout the year, except in May and June. Chennai was developed after 1639 when the East India Company established a fort and trading post at the small fishing village of Chennai. Over the past three and a half centuries, the small fishing village has grown into a bustling metropolitan city which is especially known for its spaciousness which is lacking in other Indian cities. Various churches and some impressive buildings remind the visitor about the long and inseparable association the city has had with the British. Chennai was also an important centre of Pallavan culture long before the British came here and the traces of which can be found in the various old temples. The various tourist attractions in Chennai are the St. George Fort, Sri Parthasarthy Temple, Santhome Cathedral, Marina Beach, Valluvar Kottam, Snake park and Children's park, Kapaleeswarar temple, St. Mary’s Church and the National Art Gallery and government museum. The Marina beach is supposed to be the second longest beach in the world and runs to a length of 12 km. The beach can be ideally visited in the early morning or in the late evening when the area becomes a virtual fair ground; with food stalls and other entertainment. The aquarium is also located on the Marina beach. The mortal remains of Dr. C.N. Annadurai, former Chief Minister of Tamil Nadu was buried at the Anna Square which is also located at the northern end of the Marina Beach. St. George Fort was built by the East India Company in 1639 -1640 and marks the beginning of Chennai as a modern city. This fort was one of the first fort used by the state legislative assembly and as the secretarial offices of the Tamil Nadu government. Valluvar Kottam was built in the memory of the poet saint Thiruvalluvar. The shrine at the Nungambakkam is constructed after the temple car of Thiruvarur. The place also has a large auditorium. large playing ground and collection of birds and animals. It is housed in an 18th century building within the fort and showcases the history of British in India. The park near Raj Bhawan covers an area of 270 hectares and is the smallest national park in India, but one may rarely come across such an enormous park actually lying within the limits of a metropolitan city. It is home to famous Indian antelope, the blackbuck, an endangered species. Other fauna seen here are spotted deer, civet cat, jackal and various species of reptiles. The Kapaleeswarar temple is the biggest temple in Chennai and is dedicated to the Lord Shiva. 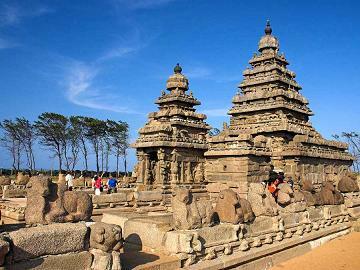 The temple contains inscriptions related to the Dravidian style of architecture. The 37 meter high Gopuram is known for its intricate carvings which depict tales from the Hindu mythology. St. Mary’s Church is the oldest Anglican church in Asia. The imposing white edifice was consecrated in 1679 AD, and continues to be an important place of worship. This Graceful monument south of the fort, was erected in 1932, to commemorate the victory of the Allied forced in the first world war (1918).After the second world war, another commemoration was added to the structure. Later on, four square pillars were erected in the seventies around the central obelisk in honour of the soldiers of the Indian army. The majestic Shia Muslim mosque was originally built in 17th century by the members of the Wallajah family. The shrine gets its name from the thousand lamps that used to be lit at twilight in the old mosque. The magnificent mosque flanked by two minarets with golden domes was built in 1795, by Muhammad Ali Khan Wallajah, the Nawab of Carnatic. It has a sprawling ground where thousands of devotees can assemble and pray. Nearby, are the tombs of former Nawabs of Carnatic. This fine zoo houses animals in a large open island type enclosures amidst natural surroundings. Other attractions includes, Nocturnal Animal House, Safari Park, Walk through Aviary, Pre – historic Animal Park, Prey-Predator enclosures and an Aquarium etc. The Snake Park located next to the National Park is first of its kind in the country. Crocodiles, tortoises, cobras, vipers, kraits and other species of poisonous and non-poisonous and non-poisonous snakes can be seen here. Snake demonstrations are held every hour in a pit near the entrance. The children’s Park adjacent to the Snake Park has a large playing ground and rich collection of birds and animals. It is believed that St. Thomas, the Apostle prayed and preached on this low hillock, along the south bank of Adyar, near Saidapet. The hillock has a natural rock cave where the Apostle is said to have lived for a while, two churches and a grotto enshrining ‘Our Lady of Lourdes’. The older church with a tiny vaulted chapel, was built in 1551, by the Portuguese’s and is dedicated to ‘Our Lady of Health’. The newer one is a modern circular structure with a blunt spire and was built in 1971. Sri Parthasarathy temple is dedicated to Lord Krishna and was built in the 8th century AD under the rule of the Pallavas. It houses the idols of the five avataras of Sri Vishnu and has a small temple shrine dedicated to Vishnu’s consort known as Lakshmi or Vedavalli Ammai in Chennai. The Santhome cathedral was built by the Portuguese between the 14th and 15th century AD and derives its name after St. Thomas. It is an important place of pilgrimage for the Christian community and as well as a historically important place. The National Art Gallery and government museum is situated in the heart of the city at Egmore. This museum was founded in 1857. 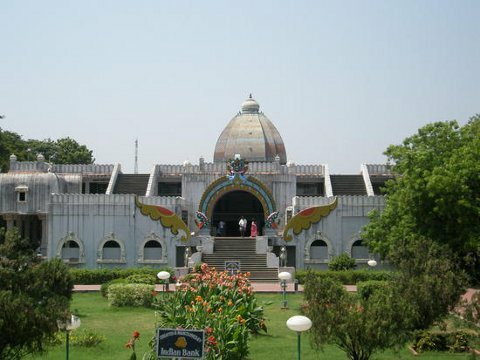 It houses various sections on geology, archaeology, numismatics, anthropology, botany and zoology. There is also a fine collection of sculpture and armoury in the museum. Chennai is one of the important trade centres of South India and is a good place to shop for a large variety of things. Chennai is also well known for silk and silk sarees, rosewood and sandalwood carvings. There are various retail shops from where you can buy traditional handicrafts, handlooms, silks, textiles, cane, leather, metal items and gold ornaments. Parry’s Corner is one of the biggest markets of the cityand deals in wholesale as well as retail trade. Trading in almost all kinds of goods from plastic goods to textiles, stationery, ready made garments, household items can be made from here at very reasonable prices. Nearby is the famous Burma Bazar where one can find all sorts of imported goods ranging from electronic gadgets to readymade garments and perfumes. For those who are looking for traditional bell metal items, bronze icons, stone sculpture, and other crafts of the southern region, the best place to shop is the Tamil Nadu State Emporia Poompuhar. Chennai is connected to all important parts of the country by the regular flights of Indian Airlines and other private domestic airlines. Besides this, various international airlines operate regular flights to Chennai from the foreign destinations. Broad gauge train services link Chennai to New Delhi, Mumbai, Kolkata, Cochin, Trivandrum, Hyderabad, Bangalore, Coimbatore, Lucknow, Guwahati and many other destinations. The metre gauge train services run between Chennai, Madurai, Rameshwaram, Tirunelveli and Tuticorin. Chennai is connected to various important cities like Delhi, Mumbai, Kolkata and various other cities. The transport corporations of all neighbouring districts and states run regular services to and from Madras to all prominent destinations in south India. Chennai is connected by a passenger liner to Port Blair in the Andaman and Nicobar Islands. To know the distances from Chennai click here.